Argentina Independence Day is one of the most important in the country and also one of the most interesting. Already touchy about foreigners invading their territory, the native tribes of what is now Argentina didn't extend a friendly welcome to the first Spaniards coming ashore on the banks of the Río de la Plata. At the beginning of the 16th century, the Indian groups in northwestern Argentina had put a stop to the Incas coming over the passes from Bolivia. One of the routes was over the Puente del Inca. The Spaniard Juan de Solís landed on the shores of the Plata in 1516 and was repelled by the Indians, captured and killed. His crew sailed away and in 1520, Ferdinand de Magellan stopped by on his Voyage Round the World but did not stay. Next, both Sebastian Cabot and Diego García sailed up the Paraná and Paraguay rivers in 1527 to form a small settlement they called Sancti Spiritus. Local natives destroyed this settlement and both explorers returned to Spain. Not giving up, the Spaniards tried again. This time, Pedro de Mendoza arrived in 1536, with large force well supplied with equipment and horses. Choosing his site well, he founded a settlement called Santa María del Buen Aire, today known as Buenos Aires. However, the natives were no more pleased with him than his compatriots and Mendoza returned to Spain, leaving behind Juan de Ayolas and Domingo Martínez de Irala. The latter went up river to found Asuncíon in Paraguay and later brought the survivors from Buenos Aires to Asuncíon. Ayolas set off for Peru, already conquered by Pizarro, and is lost to history. In the late 1570’s forces from Paraguay established Santa Fé in Argentina. On 11 June 1580 Juan de Garay re-founded the settlement at Buenos Aires. Under Garay’s successor, Hernando Arias de Saavedra, Buenos Aires took root and began to prosper. Meanwhile, on the other side of the continent, expeditions from Peru and Chile, some as early as 1543, followed the old Inca roads into Argentina and created settlements on the eastern slopes of the Andes. Santiago del Estero, Tucumán, Córdoba, Salta, La Rioja and San Salvador de Jujuy are the oldest towns in Argentina. News of the French Revolution and the American Revolutionary War fostered liberal ideas among Latin American intellectuals and politicians. The Viceroyalty of Río de la Plata, created in 1776 and encompassing what is now Chile, Paraguay, Argentina, Uruguay and part of Bolivia, fell apart when Napoleon invaded Spain and deposed the monarch, Ferdinand VII. The prospering port city of Buenos Aires presented an attractive target to the British, now engaged in the Peninsular Wars in Europe. The British invaded in 1806 and again in 1807 and were repulsed. Repelling a superior world force gave confidence to the colonial forces who turned their attention to their own political situation. After the French seized power in Spain, wealthy merchants in Buenos Aires were the driving force behind a revolutionary movement. On 25 May 1810, the cabildo of Buenos Aires deposed the viceroy and announced that it would govern on behalf of king Fernando VII. The city formed its own junta and invited the other provinces to join. However, disagreement among the political factions delayed a formal declaration of independence. While discussions ensued, military campaigns led by General José de San Martín in Argentina and other South American countries between 1814 and 1817 made independence from Spain increasingly a reality. It wasn’t until March of 1816, following Napoleon’s defeat at Waterloo, that representatives of the various provinces met in Tucumán to discuss the future of their country. 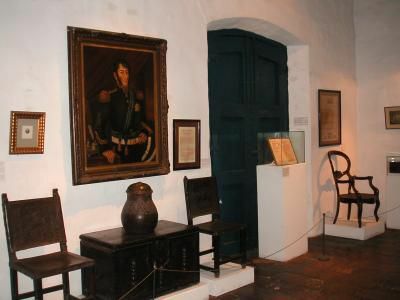 On July 9 the delegates met in the Bazán family home, now the Casa Histórica de la Independencia museum, to proclaim their independence from Spanish rule and the formation of the United Provinces of South America later the Provincias Unidas del Río de la Plata. The Acta de la Declaración de la Independencia Argentina signed, the newly formed congress couldn’t reach agreement on a form of government. They appointed a supreme director, but many delegates preferred a constitutional monarchy. Others wanted a centralized republican system, still others a federal system. Unable to reach consensus, the opposing beliefs eventually led to a civil war in 1819. Taking power, Juan Manuel de Rosas, ruled from 1829 to 1852 while acting as a caretaker of the external relations of the whole country, who lacked any other form of federal government. Acknowledged as a tyrant, Rosas was overthrown by a revolution led by General Justo José de Urquiza under whom Argentine national unity was established, and a constitution promulgated in 1853. Argentina Independence Day is now celebrated July 9th.